Finally available are the full details and cover art of the July 2008 releases from the Follow That Dream collectors label. 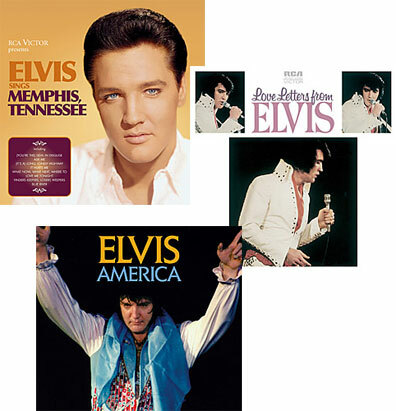 The releases are "Elvis Sings Memphis Tennessee" (originally "The Lost Album") and "Love Letters From Elvis" in the Classic Albums re-issue series and a soundboard concert release from April 22, 1976. 2001 Theme / See See Rider / I Got A Woman - Amen / Love Me / If You Love Me (Let Me Know) / You Gave Me A Mountain /Trying to get to You/ All Shook Up / Teddy Bear - Dont Be Cruel / Heartbreak Hotel / America The Beautiful / Polk Salad Annie / Introductions / Hurt / Hound Dog / Help Me / How Great Thou Art / Little Darlin'/Its Now Or Never/Funny How Time Slips Away / Can't Help Falling In Love / Closing Vamp. Bonus songs from Spokane, WA 27.4.76 : Burning Love/My Way. You CANT Talk to the manager! If anyone knows of a place to buy FTD'S at a reasonable price who packages these things right and does not throw them in a cheap bubble mailer and has a return policy let me know,if not i think im giving up on buying these things,i hope someone else takes over the orders at elvis.com,i have said this a few times before and seem to get the childish remarks,but know of many other who are having the same problem,i just had a replacement order sent again inthese same cheap bubble mailer,you can talk to a manager,and even though they put a note on my order it was still sent the same wrong,i hope that music today who takes elvis.com orders loses this account but from the tone i get,they dont care,there manager needs to be fired,if you have had the same thing happen to you im me or email or whatever,and if you you have a snide childish remark to make save it,i am a part time seller and would never treat my buyers in such a way! I hope that Elvis Country is next,One of my favorites .Love Letters will also be nice,though alot of slow songsi guess when im over you will be the unedited version that was on some boot cd! I think the two new covers are fine. Bring 'em on! I have no problem wih "Something" on the album (for whatever reason.) The "Colonel" is dead. I'm looking forward to these releases. I like the cover art on "Memphis, Tennessee". Ernst mentions in "A Life In Music" that the Colonel suggested adding a live version of "Something" from the August Las Vegas tapes to "Love Lettters From Elvis" for it's original release in 1971. What a nice surprise America is. Don't like, with few exceptions, Elvis concerts in 1976 and 1977. In a matter of few weeks Elvis would finish his shows after Hurt! But this one is not THAT bad. Shakingruud, the reason there ain't no outtake of "What now..." is because there ain't any, the master is take 1. Really nice cover on "Elvis Sings Memphis, Tennessee." Also, a nice touch to use the original cover for "Love Letters From Elvis." This cover was quickly replace with one that moved the word "From" to a second line below "Love Letters." Boy am I looking forward to getting my hands on these. The cover for Memphis Tennessee is a bit of a surprise, but not unwelcome as that is a great photo of Elvis. And as for the track listing, really looking forward to adding these to my collection. A friend of mine no longer bothers with these live CD's but I am looking forward to another concert. Keep 'em coming. I don't consider a "Live" track on "Love Letters" any more out of place than a "Live" track, "It's Impossible," was on "Elvis" (Fool) back in '73. Looks very good to me...........keep on going Ernst !! Does anyone know the dates of the 'something' tracks as its not listed in the TTWII booklet and the one on 'love letters'? I wish FTD had used the original 'lost album' cover for the 'memphis, tennessee' as it looked more like a 60's album. I'll be getting the soundboard but it would have been more appropriate if we had the rest of the Aug '70 vegas concerts. Terrific covers (a nice change). Memphis Tenn looks awesome, i'm glad they included the 1964 session. I am bugged about Where did they go lord, as many of you are, why put a live track on love letters it's out of place. For what it's worth there are posts on another Elvis site that say all the bonus songs on "Love Letters" were considered for inclusion on the original album. And that the version of "Something" included is not the same version as featured on TTWII (FTD). Personally, I'm fine with the album as is. Also, really looking forward to "Memphis, Tennessee." No interest in the soundboard. Interesting tracklistings on the clasic albums, but why did they squeeze 'Something' onto Love Letters? Wasn't that track also on the FTD-release of TTWII? Or is this a recently discovered studio version? Seems like a mistake. Can anyone tell me more? Boy how I dislike FTD squeesing "RCA Victor" onto non-classic releases. Nice and clean covers though from FTD (for a change), and I've always kinda liked the cover for "Love Letters From Elvis"